Maybe it’s just that Hin Daeng is easier to pronounce than Hin Muang, especially for foreigners. The two dive sites are right next to each other, and very similar in their topography and the marine life that scuba divers can expect to see there. It is claimed that Hin Muang has more purple soft corals than red, when compared to Hin Daeng. Hin Muang’s pinnacle can be seen above the water’s surface at low tide, but there is no opportunity to do anything here, such as relax on a beach. It literally is a bit of rock sticking a metre or two out of the water and hardly big enough to notice. What lies underneath is very different, though. Hin Muang is home to the deepest and steepest drop-off wall in all of Thailand. It really is something that needs to be seen to be understood. The wall continues down into the dark depths of the sea. Experienced technical divers are able to descend to 70 metres, but of course most divers are limited to 30 or 40 metres. Those who are lucky enough to go diving at Hin Muang are guaranteed to see one of Thailand’s best dive sites. In fact, on its day it can be the best. It just depends on the sea & weather conditions, the marine life seen and how many other divers are there at the same time. Because Hin Muang is a submerged pinnacle in very deep sea far from the nearest island and even further from the mainland, it is exposed. This means that surface waves can be an issue because there is no land mass to offer shelter from wind or the waves. Also, there’s nowhere for the dive boats to get protection, so things can be a bit rocky on some days. The good news is that the depth and distance from everywhere else means that the water is usually very clear. 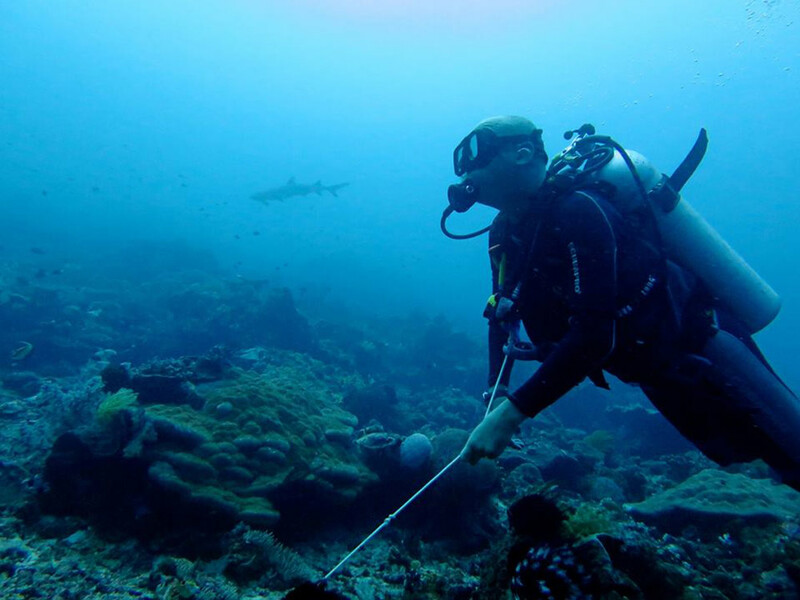 Divers at Hin Muang can expect 20-30 metres visibility during the diving season. Currents can be an issue, but with a good dive plan it’s normally ok. Divers can get shelter from the currents, or change the dive order, and visit Hin Daeng instead. Almost anything can be seen when diving at Hin Muang. This includes bony & cartilaginous fish, invertebrates and reptiles. 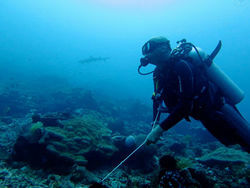 Some divers who are able and prepared to go very deep at Hin Muang report several shark species which are not normally seen by divers in Thailand. The wall is covered in soft corals, which are home to many interesting critters. And every diver at Hin Muang hopes to be lucky enough to spot a visiting Manta Ray or passing Whale Shark, but these can never be guaranteed. How many divers normally go to Hin Muang on a normal day? This is something that makes Hin Muang arguably the best dive site in Thailand. Not only is it large, deep and right next to Hin Daeng, not many day trip or liveaboard diving boats visit this location. Therefore, the dive site is rarely crowded. It’s quite common for a dive boat to be the only one at Hin Muang & Hin Daeng, and even if there are two or more diving boats there, they can easily manage the dive timing and which of these great dive sites are visited in which order.